"Nothing says summer like the good ol' G&T!" Place the ice cubes in a tall, narrow glass with the ice coming near the top. Pour gin, tonic water, and lime juice over the ice. Stir well with a long-necked spoon. Garnish with lime wedge, and serve immediately. See how to make a refreshing gin cocktail. Sorry...much too much lime juice! Choose between the juice and the wedge. This is a great recipe! So simple, yet so quintessentially summer-time British! Cheers to all! To us Brits, a G&T comes with a wedge of lemon. Lime will do at a push, but lemon is the way to go! 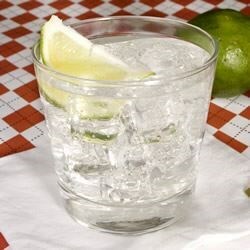 Never tried gin in my life til i had a gin and tonic. All i can say is mm mm goodd. fresh lime is the key to this delicious drink. Instead of the fresh lime juice; add 1/2 to 1 shot of Rose's Lime Juice. Great!